Congratulations! You just unhatched a CatDog Easter Egg! So what's inside this egg? 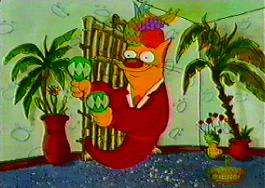 Well Click our adorable shaking maraca Cat to find out. Recently thanks to ebay, I bought a bunch of storyboard papers from a few different episodes. And you guessed it, since this egg is found underneath the Dog Come Home link, this is from the scene where Cat is happy that Dog left, and he's shaking his maracas as you see in this picture. Well the Easter egg is this: the original storyboard idea, was to have Cat dressed very authentically like Carmen Miranda, a popular Spanish actress, singer and dancer from old movies that Bugs and Daffy and more cartoons back then were constantly imatating. Enjoy your animated easter egg! Hi ho diggety a Spanish omelete yum!